Once I gathered my supplies this wreath went together in under an hour. First, cut your stems so you can arrange them around the wreath base. You can add hot glue to the ends if you like. I also attach them with floral wire so they are nice and secure. This is the foundation for the wreath so you want to ensure it is solid. Just bend and straighten the individual stems until it is even all the way around. It is always good to start with the largest pumpkin first. I look at the wreath as a clock and add the largest pumpkin to the number 6 spot. I knew I would be hanging this wreath above my mantel, so I first placed it against a wall to see how far forward the pumpkin needed to go. I learned a trick last year with paperclips-they are great for attaching foam items. I used to buy the floral clips but they are a little pricey. Paperclips can accomplish the same job. 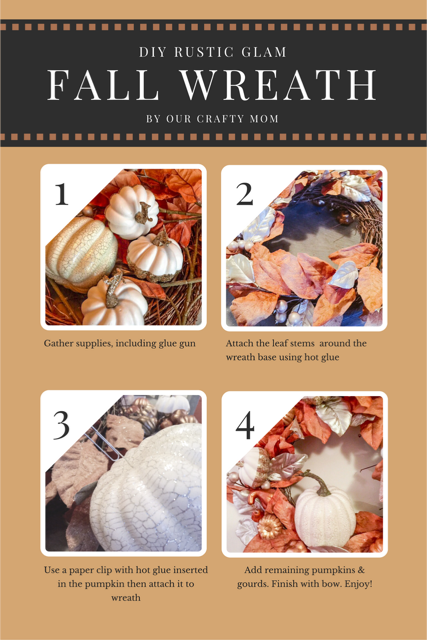 Just bend the paper clip to put one end into the base of the pumpkin-add a little hot glue at the end of the paperclip-then add the other end to the wreath with hot glue. If you are using a foam wreath-even easier, just stick it right in. Next, attach the 3 smaller pumpkins wherever you like. I added one to the 12 & 9 spot, but because I was adding a bow to the 3 spot, I added the pumpkin under the bow. Use the same paperclip technique as show above. Definitely add the hot glue, though-we don’t want any pumpkins falling off! This is the perfect time to add your ribbon. There really is no set way to do this. I just play around with it prior to attaching until I like how it looks. I always make my bows with 8-10 loops for a standard size wreath. The bow was secured with floral wire to the wreath base. 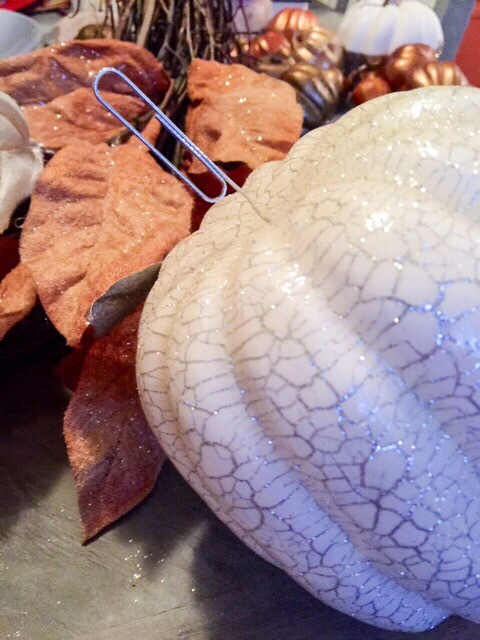 Finally, add the smaller gourds and pumpkins with hot glue. You really can customize to your liking. Originally I planned to add some neutral sunflowers, but once it was complete, I decided I didn’t need them. The focus really should be on the gorgeous metallics. 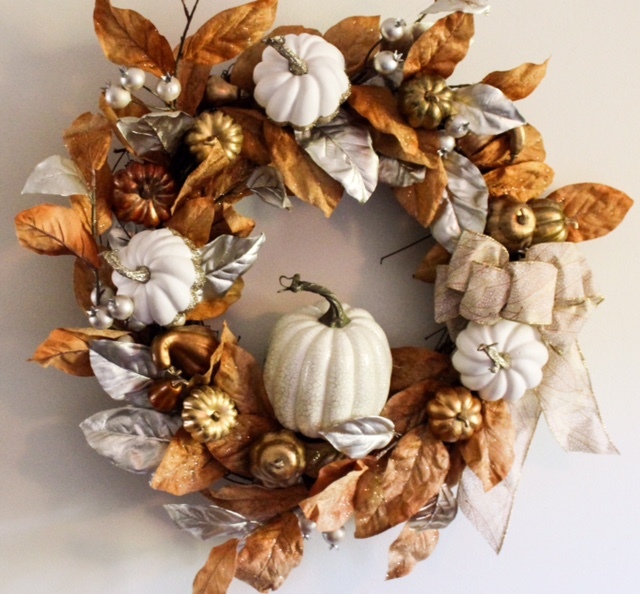 Be sure to check out all the lovely fall wreaths shared by the talented bloggers below. You are in for a treat! Thank you so much for visiting Our Crafty Mom! Be sure to check back often as I will be sharing lots of Fall goodness with you! Have a great day. I would never have thought to use a paper clip! Great tip! Also, super jelly of Joann’s – we don’t have those here in Canada! Michelle your wreath looks great! And I love your new site! Pinning!! What a great idea to use paperclips to attach things to the wreath! 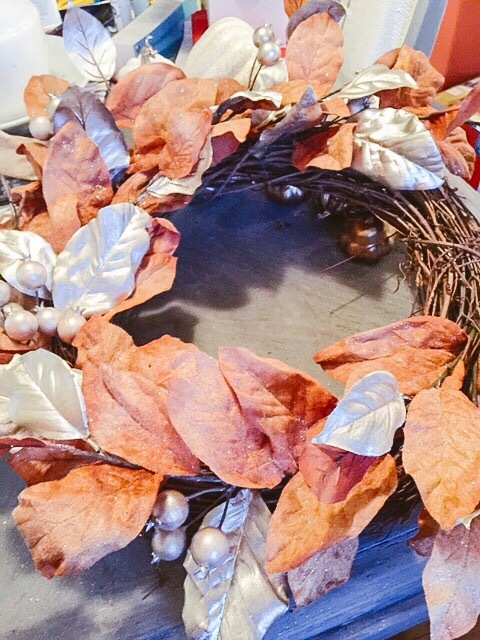 I am a sucker for metallic anything, and this wreath is gorgeous! I love all of the metallics, especially the copper! So fun for fall! Hey Michelle…you have some serious wreath making skills, though your tutorial will surely help those of us with fewer talents in that area! It is really gorgeous, glitzy and fun! Yeah, and that paperclip tip…thanks!! Thanks so much Lynn! I have to say creating wreaths and swags-were the first thing I started crafting probably when I was 22 yo. It will always be my first love 🙂 I took a wreath making class at a little craft store in Town and was hooked! 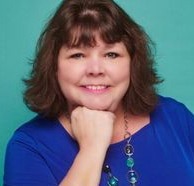 Hey lady, stopping by to let you know you are being featured today on P3 Party post! Love this beautiful wreath! Have a great weekend! Thanks for pinning! I love Rustic Glam for Fall!! You can’t go wrong with metallics in my book. Lovely job. This is very pretty. 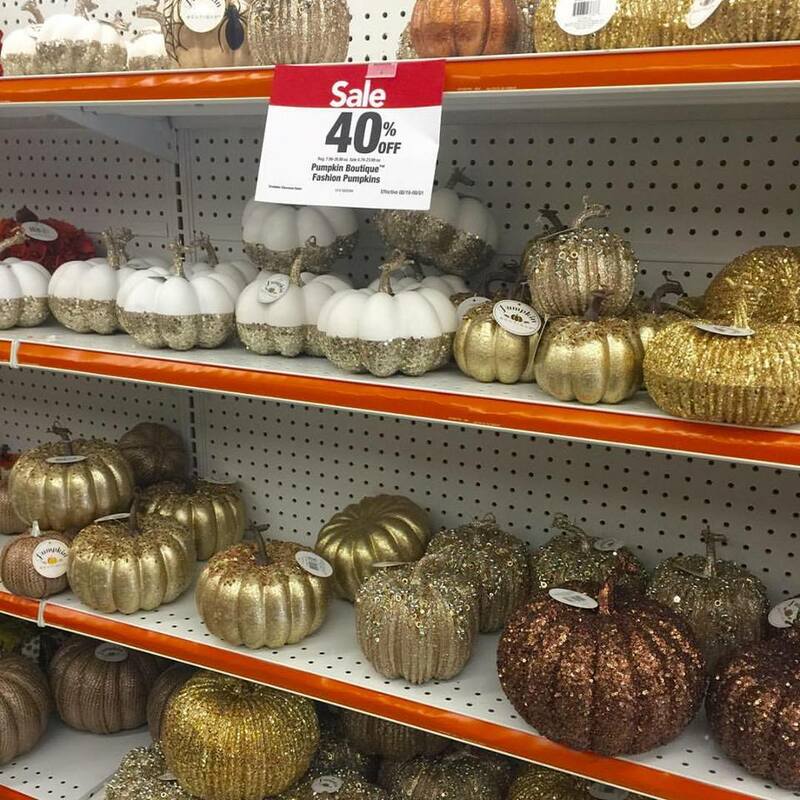 I love those gold and white pumpkins. I love fall crafts so much. This is a gorgeous wreath and I can’t believe you made it – very talented! 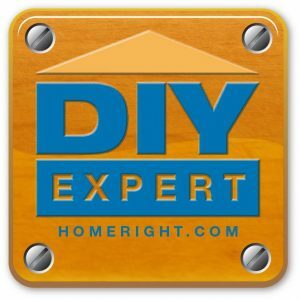 Thanks for sharing your method and the excellent tips! You fall wreath turned out beautifully! I love the idea of using a paper clip. Brilliant!!! Lovely wreath! You’re so creative! I really love the way the white pumpkins pop against the metallic leaves! So pretty! I love this soooo much! You created a high-end masterpiece Michelle! I feel so in the mood for Fall now! Question, what’s the name of this cute little pop up share plugin you using? thx much! What a cute idea! This must have been so much fun to make! Thanks for sharing! 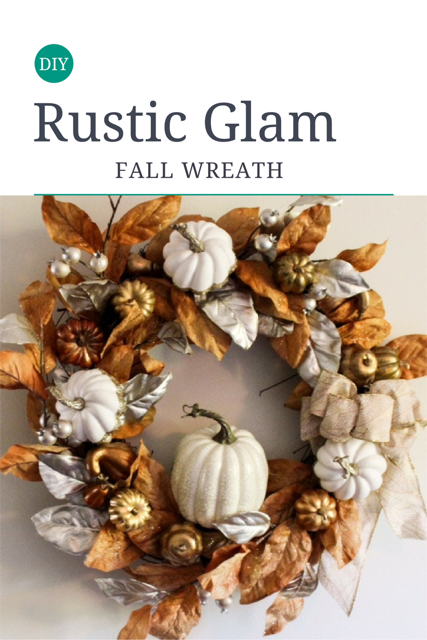 I love the rustic glam look and your wreath is beautiful. Thanks for sharing at Snickerdoodle. Pinned. 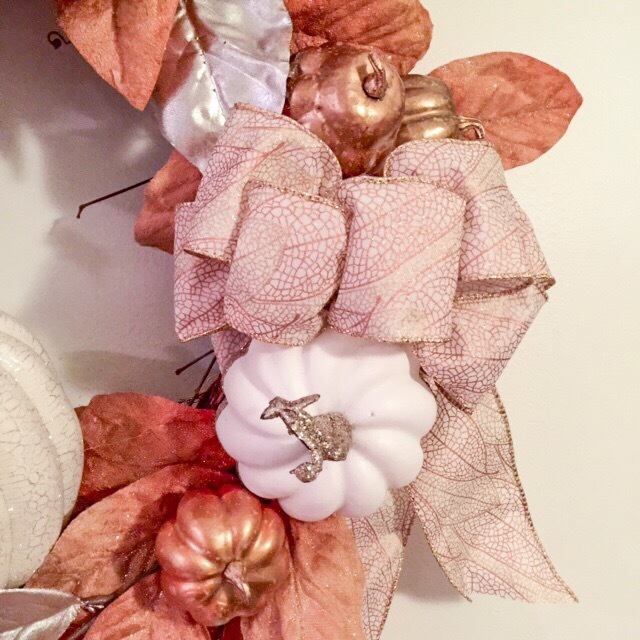 I just love your glam Fall wreath! It is so pretty. I have not been to Joann’s in a while but I have lots of coupons. Love that store! I love neutrals and metallics for fall, Michelle. Your wreath is lovely! Thank you for sharing @Vintage Charm! I’m impressed that you gathered your supplies when you had a wonderful opportunity. You made a gorgeous wreath and I’ll bet it looks festive above your mantel. I saw your link at Sweet Inspiration Party. What a fabulous Fall Wreath! Love the tones in your wreath and the sparkles!! 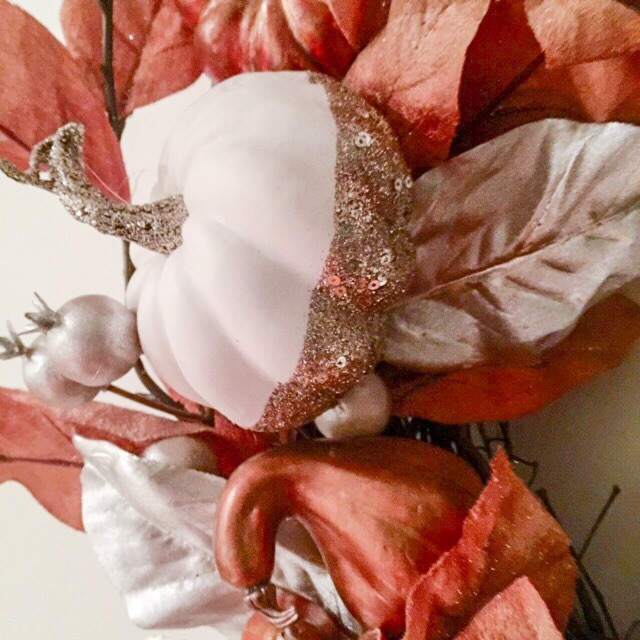 Love this fall wreath and also are your helpful tips! Your home will look beautiful with this festive wreath!